When I last wrote on bitcoin, the price was somewhere in the vicinity of $4,500. Bitcoin’s price continues to defy gravity. Not just defy gravity, the price has gone up vertically! It has more than tripled in three months since I last wrote. I don’t know of any other asset/currency that has moved up in value so fast….ever. Is this a bubble? 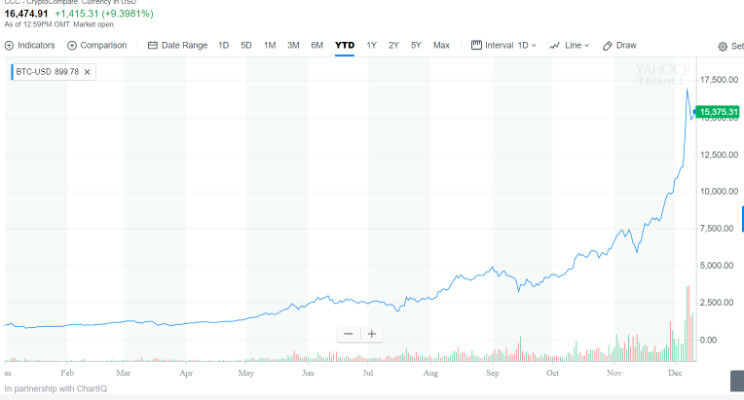 Even if one considers the possibility that this is not a bubble, one is left with the unanswered question what could have possibly changed over the last year (1500%+), month (100%+), or week (40%+) to have warranted such drastic changes in value. I think we can safely agree the explanation cannot be rapidly growing adoption. To justify a $15,000 value for a bitcoin, assuming it has the same velocity as a US dollar, it would need to represent 6% of all transactions. That is far from true today: even the lead users might not use bitcoin that frequently. Of course, as discussed in a previous blog, the velocity of bitcoin is far slower and it only represents a much smaller share of transactions. This “slow velocity” or constrained supply of bitcoin is what I believe is responsible for the rapid price increases. Moreover, demand from ICOs and speculators is squeezing that supply. To cross check this understanding and the design of the network, I researched bitcoin mining economics, and here is what I found. Most of this data comes from Blockchain.infoand is readily available to anyone to replicate these calculations. Bitcoin is a very poor payment system. The cost of running the Bitcoin network is ~$6.5M/day and the transaction fee covers only $3M/day. The fee doesn’t cover the cost of running the network despite the fee per transaction already being an insane $50+/transaction. Per some observers, the cost per transaction on the bitcoin network is 1000x more expensive vs Visa/Mastercard network. Mining today (at $15,000 per coin) is very profitable, but only because of the mining reward. The reward for confirming a block for the network is 12.5 bitcoins. This represents today 80% of the revenue that the network makes. With this reward there is a strong incentive to mine coins (75%+ gross margin), without this reward, there is no incentive to mine. And in case you wonder who pays for this mining reward, it is everyone who owns a bitcoin. Mining reward (today) corresponds to an annual 3.5% tax on all bitcoin owners. But the long term supply of bitcoin is limited to 21M coins, and the system is designed such that the mining reward for solving the block should half every four years. Raising the transaction fee further from $50/transaction: That will kill any hope for wider adoption of the bitcoin. An even higher transaction fee per block, which may or may not get spread over more than the 3000 transactions that are within a block today (depends on real world adoption). Energy (or silicon costs) are unlikely to half every four years, as the cryptography problem keeps getting harder over time in order to keep the time to solve a block around 10mins (to offset more and more hash power coming from more miners on the network). An increasing bitcoin price to pay for the networks energy/silicon bill: If energy costs were to stay where they are (which they wont given the every increasing complexity of the cryptography problem to keep time to solve a block at 10 mins) and halving of mining reward every 4 years, that would require the bitcoin price (in steady state) to double every four years. That is almost 20% p.a. increase designed in….. forever! While trying to further cross check the order of magnitude of these numbers, I came across a paper by Harald Vranken (where he looks at environmental sustainability of bitcoins) which came to similar conclusions but in Feb 2017… bitcoin price has of course changed quite a bit (10x) since then. Having discussed 1 and 2… we are left with 3. And while it is not a conclusion supported with unquestionable evidence, it is a conclusion from deduction (and a couple of anecdotes). The design of bitcoin network would support “only” a 20% per annum increase in its value. With bitcoins having gained 15x value over the course of 2017, it seems likely the reason for this rapid rise is the result of mass speculation. While I don’t have evidence, I have anecdotes of people either inquiring about investing in bitcoins or being already invested in it. These acquaintances have no background in finance or in investing. Typically, that is a sign of an end of a bull run! I stand by the not-so-headline making conclusion I drew last time – it is both a beginning and a bubble! While there is value in bitcoin, I don’t know why it should be $15,000! With bitcoin now trading on future contracts, I don’t know which way we are headed next. What do you think? Please do share your thoughts. Exhibit 2: Harald’s view of Daily Revenue/Costs of Bitcoin mining (as of Feb 2017). The price of bitcoin has gone up >10x since then…. Previous bitcoin: Bubble or Beginning? Both! Next Is regulation coming to a Technology near you?